I sure hope everyone had a really nice Memorial Day Weekend. That everyone got to spend time with their family, barbecue (weather permitting), and just relax. This past holiday weekend we decided to take in two older ladies to take care of. We could not resist. They are both in need of some TLC. First I am going to get all that old makeup off of them. They need lessons. All that makeup is really aging them. 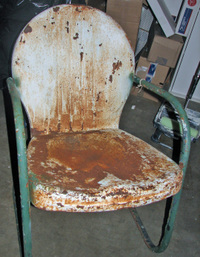 Second, I am going to fix all the holes and dents. Make their skin all smooth again. Then it is off to be primed (man do you not wish it would be so easy for the rest of us.. smooth us out and spray on some primer then paint... ). 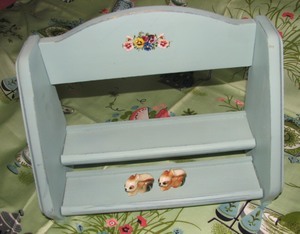 Then both Mabel and Hortense are going to be painted blue or cherry red. I really like this harbor blue color, so that may the color we go with. 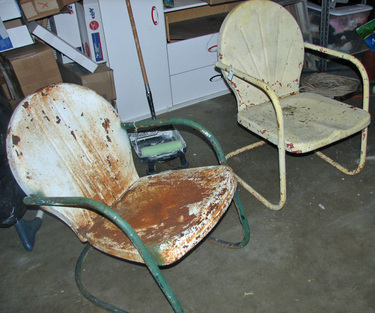 I cannot wait to get them all cleaned up and on our back patio. I bought them for a song, a whole $15 dollars. We even, as you can see from above have them named. Emma's is Mabel, the name she chose, and mine is Hortense. They just sound like two ladies that would sit on the patio drinking lemonade and having fun talks while crocheting. This is Hortense, she is mine. I wish I could find a way to date these girls. Cleaning them up will not be too easy. It will require taking them out in the backyard, wearing a mask and gloves and coating them with this gel paint remover (which, I am sure most of it will just fall off). Then to get the car epoxy out. My dad restored a 1964 Chevy pickup that was in way worse condition, so anything else is possible. 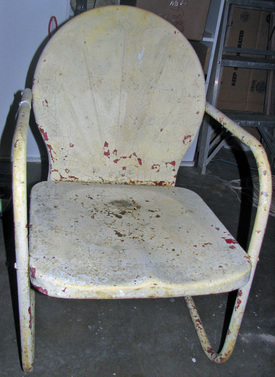 They are in really good shape except for a few little holes where they have rusted through. I cannot believe the previous owners did not take better care of these two ladies! Shame on them. This is Mabel. She is Emma's. She wanted Mabel the minute she saw her. I will be sure to take pictures along the way. I may just have to start a Flickr group -- "How Mabel and Hortense got their groove back." 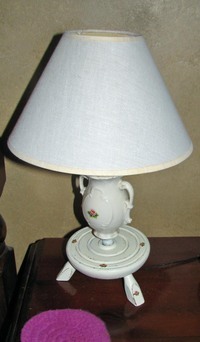 Cute little lamp for Emma $3.00. 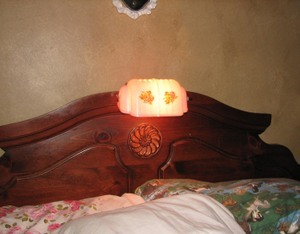 Awesome bakelite head board lamp $9.00. Getting to take all of this home for $27.00 -- priceless. There was even some cooler stuff there, but I used some restraint. They had the metal lawn chairs I remember at my grandmother's house... but I did not get them. I want a metal glider soooooo bad. So, I will just wait. Well, look what we found in the attic! 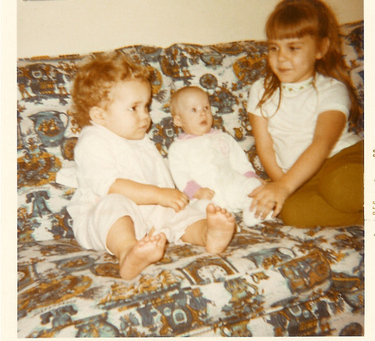 The one on the very left was my very first Mandy. Then there is Becky, Jenny and then an older model Mandy. The Mandy on the far left I bought for Emma. She loves these dolls. 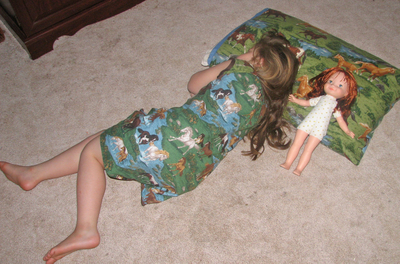 So funny how she finds these dolls more fun than the ever so expensive American Girl dolls! 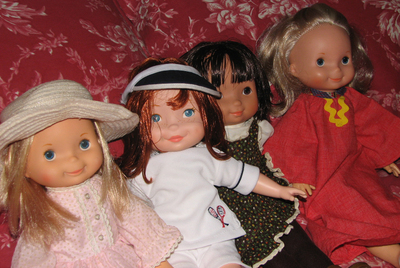 There were several of us girls in the neighborhood that had these dolls.. Michelle, Gwen and I all had one of them. My mom made them the kaftans, and I think she also made them capes. We took them everwhere, even when we stayed the night at each other's homes.. they went along as well with their nightgowns. We even took them to the creek! Our moms about killed us over that one!!!! 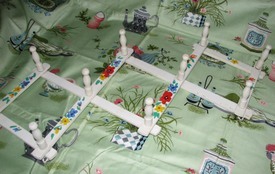 I have since obtained most of the patterns that came with the clothes and then the My Friends four seasons of patterns. I have cut out a few with the vintage material my mom dug out of the attic. Now I just need to sew! I have quite a few clothes already! I cannot believe so many of them made it through. My Mandy is one of the originals, #210. She is in fairly good condition considering the gal is over 20 years old. I even made it out with two pairs of white clogs, 2 pairs of white shoes, a pair of brown ones, and her brown riding boots. I kind of wish Fisher Price would make them again. They are just too cute. 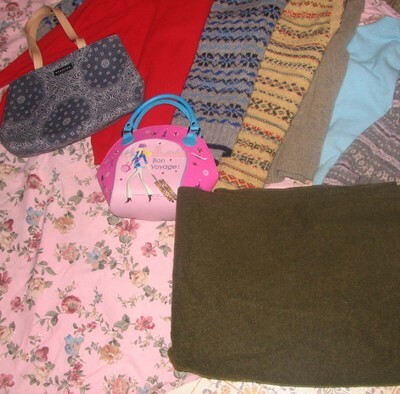 I got 6 wonderful wool sweaters to felt, a Barbie bag for Em, a cool Kenneth Cole purse for myself, a King+ size pink floral cotton sheet and an wool army blanket that happens to be in perfect condition. All for the grand total of $38.57. Our Goodwill stores really never have any cool dishes, cups, etc. I did get two french glass containers. But I do love our Goodwill stores. I wish we had a lot more of them. Yes, I am up and it is 1:13 am. Been getting things cleaned up around the house. My dad got up in their attic. He is in the process of cleaning it out now that they have a nice brand new storage building. Shoot a little insulation and dry wall and a person could live in that thing. It is probably bigger than some apartments on the north eastern seaboard. 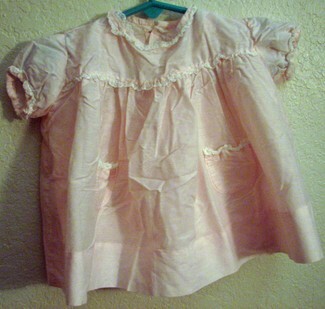 First, above is a pink little dress my Grandmother hand sewed for me. You cannot see it, but there is even a hand sewn slip underneath. 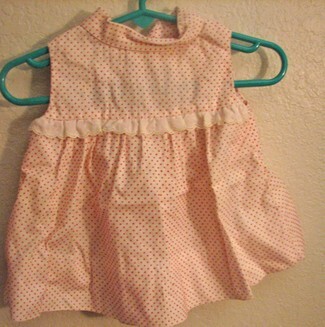 Second, red swiss dot dress my mother sewed for me as a baby. Next up we have a pink swiss dot number with pink flowers and a detachable pink velvet bow, sewn by my mother. 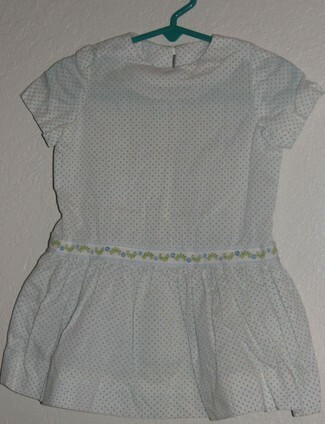 This was the dress my mother made for my second birthday -- a little blue swiss dot dress. 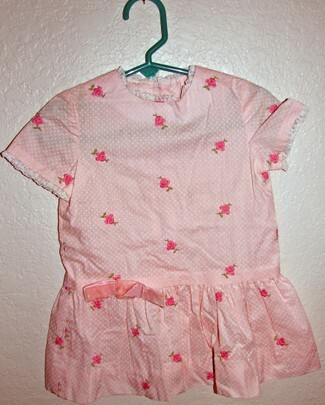 We have pictures of me somewhere in this little dress. Boy it is so hard to imagine ever being that small! Now this is my favorite dress. The pink swiss dot, white swiss dot peter pan collar, the 4 little heart buttons. My mother made this too. We cannot remember what event she made this for, but I definitely do not remember any pictures with me in this dress. I really wish we had remember these when Emma was born. I would have loved to of had pictures in all of these. I do have pictures of her in my little Bryan dresses and the pictures they took of her in the hospital is of her in the dress my parents brought me home in when they adopted me. So, I guess I do have pictures of her in some of my dresses. 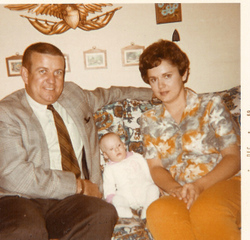 On November 7, 1969, my parents, Ann and Bill went to Oklahoma City excited they were finally going to be family. They were on their way to the Department of Public Welfare to pick up Nancy Dunn aka Baby girl Dunn, soon to be named Beth from Hedwig McLaughlin. They had been given the opportunity to adopted another little girl just two weeks before, but Bill had told Ann that "it just wasn't right." When Ann called Bill on November 6th all he could say was, "well, let's go pick her up". And that is how I found my family. They picked me up and it was in the 80's outside, and I was in a hot itchy pink dress. The same dress that can be seen in the photo below. That is Emma when she was not even 1 day old. I thought it would be wonderful to have Emma have her picture at the hospital taken in that same dress. Anyway, it was hot and my father took that dress off of me because it was itchy and hot. I had been in foster care since I was born. My mother signed the papers the relinquish me from her custody on August 11th. Mind you, I was born on July 29th. I guess I was not in too good of spirits due to horrible diaper rash and ear infections in both ears. Hmmm, some wonderful foster care. My parents took me home and they were hosting a party for OSU Homecoming that very weekend! So they had a houseful of guests and the meaning of Homecoming took on something very different. Now for some information on my biological parents. In 2001, I had the judge in Payne county open up my records, and I received non identifying information from the state. Oklahoma is a "closed record" state, which I hate. I see the purpose, but come on, I have parents. I just want to know who they were/are. What were they like... shoot.. who the heck do I look like! My mother is Verna Dunn. She was born in 1947 in Oklahoma. She was 5"2" with blonde hair and blue eyes. She was going to college at the time she became pregnant. She was going to school on a national Defense loan and was working as her parents were not able to help her in any other way for college. Her major was Sociology. She planned to go on and earn a Master's Degree if she could financially. 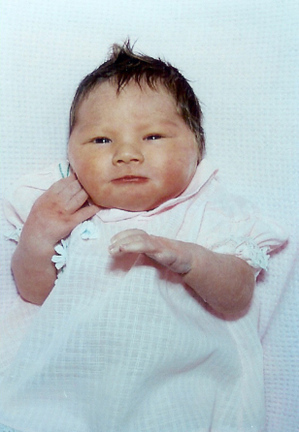 She lived with relatives in Oklahoma during her pregnancy. I was born in Ardmore, OK at the Memorial Hospital of Southern Oklahoma. My mother had two siblings. Her sister was 22 years old and had graduated from college. She also had Blondie hair and blue eyes. Her brother was 15 years old. He was a sophomore in high school and also had Blondie hair and blue eyes. My grandmother was 44 years old and was 5'3" with Blondie hair and blue eyes. She worked in a manufacturing plant in July of 1969. My grandfather was 45 years old. He was average height with wavy black hair, medium dark complexion and was of French descent (HM, always wondered where my love of the French came in...now we all know). He completed high school and was a Chamber of Commerce president at one time. He worked in the insurance business and in real estate. My paternal great grandparents both had blue eyes, black hair and both had dark complexions and also of French descent. Now, my father.. do not know his name. I guess in 1969 it was not required he be listed, interviewed, anything. Anyway, he was six feet tall, had black hair, blue eyes, and a medium complexion. He was junior at a University in Oklahoma. He was a football letterman and maintained a B average. They had dated for 3 months. He knew of the pregnancy but was not ready for marriage. He knew nothing about Verna's plan to place me for adoption and did not want him interviewed. All she told the caseworker is that he was from Texas and he had some younger sisters and his parents were living. I have tried to find her because I really want her to know I am fine. She did a wonderful thing for me. I look up to her because I do not know if I could do the same. I could never give my flesh and blood to someone else with the hope they would raise and take good care of my child. What an unselfish thing to do for someone! I would like to also find her to find out who my father is. He has the right to know what happened to me. Plus, they have a grand daughter. I think if I ever do try to find them I will have to hire a professional, which I just do not have the money for that. I will leave you with one last picture... thank you for taking the time to read this, if you made it to the end. 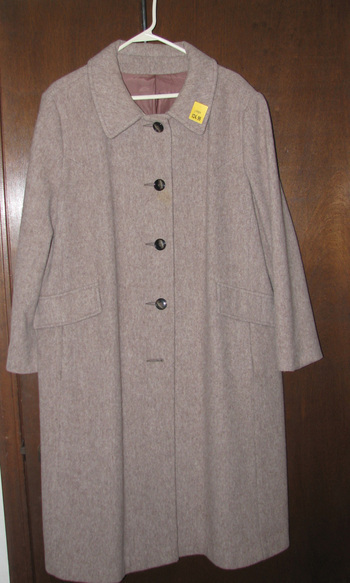 Above is my wonderful Salvation Army wool coat find. Cost me a whole $10! It is in perfect condition except for one spot, and I have already tried spot removing it and it is working. My picture makes it appear there is a button missing, but that is not the case. I have been busy at it this weekend sewing our Halloween costumes. We (Em and I) are both going to be witches. I have hers complete except for a button and sewing the rest of her hat together. I just have the hat left for mine. I would like to tell you that I am exhausted and really do not see how I can spend another minute in front of the sewing machine.... but I will. Just so Em will look adorable (I could care less about me.... I am really trying to dodge that bullet). 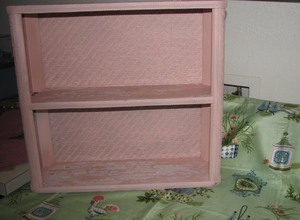 I was going to take some pictures, but I will wait until I am completely finished with the costumes. Okay, I have to admit what I really did was leave the darn camera at my parent's house, and I just do not want to walk over and get the thing. Did anyone get the newest Edition of Martha's Living? 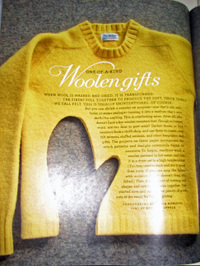 Very nice article on felting. I bought a couple of sweaters along with the coat above that I really need to get to. If I can just get past this Halloween sewing. I find it kind of funny she brings this up after Wonderful Miss Alicia has already been doing this (well, we all have, but Alicia does it so well, I just had to link to her Turtle Sundae purse). While at Salvation Army/Goodwill I also came into possession of some wonderful wool blazers, pants and skirts to make really cool scarves and purses out of. I have completed one, but there are many many more to come. If I just had more time... you know the more I get into this the more and more I wish I could just quit my job and do this full time. It is much more rewarding, and I have always been the type to like to make things, whether food, crochet, sewing, etc for others, not myself. I mean, I can cook a huge meal, and I get way more enjoyment watching the others enjoy their dinner. Same with sewing, crocheting, knitting... and on and on. Oh maybe someday I will get that chance. I guess I should start buying lottery tickets so I can afford to stay at home... lol Maybe the Gods would smile down upon me one day and let me get the winning lottery ticket... well, one can always dream. I went to Goodwill today for lunch. I walked into the store and walked around the housewares department, just scanning... then I went to the book section. Oh my gosh, I looked up on the shelf in the kid's section and there it was, a pristine Holly Hobbie book. It is The Days of Holly Hobbie from 1977. It is in brand new condition and all mine (or well, Emma's). It is the sweetest little book. Reminds me of being a young girl, still playing with my barbies and making them clothes (or wait, I still do that... just with Em's barbies..lol). I just thought this would be a cute book for Em to read. I also bought Creative Knitting and Crocheting by Rosalin Carlson, from 1969. The inside cover states "Everything you need to know about knitting for plain or for fancy - original designer clothes, afghans et al.". Mrs. Carlson started the Sears Roebuck Knitting School Program by the California stores. She developed the program, trained the 36 instructors and this led to the training of of over 20,000 pupils in less than 3 years. WOW! I have been working on a sweater for the Rogers' County Fair. I have until September 13th to finish this.... hopefully I can. I so many things I want to start.. just too many ideas and not enough time to act on them. I have been told I have plenty pictures of Em on my blog, so I am going to post one of the both of us.. to remind me of my parents leaving tomorrow for Colorado. I wish I was going. I love going there this time of year... it is starting to get cooler. One year they actually got some snow higher up in the mountains. 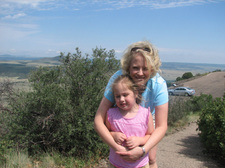 This picture of us is on Mt Capulan, an extinct volcano in New Mexico. The first time we went up it was bitter cold up there at the beginning of September. You can see for miles up there. We are back from Colorado. We had lots of fun, and I will get all of the photos uploaded and loet everyone know when they are ready. The first day we stopped at Capulan, an extinct volcano in New Mexico. We went there when Emma was 10 months old, so we thought we would take her back. The second day we went to Salida, CO for a picnic and play time down by the Arkansas River. The third day, Saturday, July 29th, we went to the Cheyenne Mountain Zoo and The Shrine of the Sun in Colorado Springs. The zoo was neat, but it was on a mountain and you always had to climb UP! I think the zoo in OK City is just as fabulous. The Shrine of the Sun was built by Spencer Penrose , the man that had the Broadmoor built. It is told it was supposed to be a shrine to himself, but his millionaire friends told him that was just taking it a bit too far, and Will Rogers died in a plane crash while it was being constructed, so it was named for him. Strange since he is buired in Claremore, OK, Will Rogers that is. The fourth day was in Florence, CO. That is where I purchased all the fabulous items. 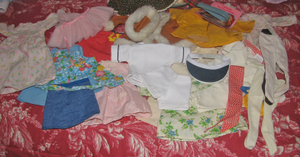 Vintage patterns, buttons and crocheted hotpads. I could have stayed for hours and shopped. We ate lunch at the Mainstreet Grille... wonderful. I had a Buffalo Burger for the first time in my life, and I can say they made it heavenly! The fifth day was Pike's Peak. I tell you, that was amazing, and if you ever get the chance, go up the mountain in the cog rail. If you do go, go early in the day so it is clear. Did I tell you there is a couple that lives on this mountain that takes care of the Manitou Springs/Colorado Springs reservoirs? Yes, they have their own "drive way". To get their mail it is 17 miles one way, oh and to buy groceries.. 70 miles one way! There house is gorgeous , as well as their grounds, but you must really love your spouse to be that isolated! There is one of the reservoirs in the picture.